Nylon collars are the perfect combination of soft and durable. They are easily adjustable, available in all your favorite colors, and your dog will love them because they are so comfortable. 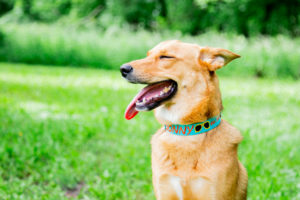 What type of nylon collar should you get for your dog? We’ve put together a guide to our nylon collars to help you decide which will be best for you and your dog. Embroidered nylon collars are surely a classic way to go! You can have your dog’s name and your phone number embroidered right onto the collar and don’t have to worry about tags at all. Even better, you can choose from 15 nylon colors and 15 thread colors to come up with the perfect combination to fit your dog’s style. There is even an embroidered nylon collar option for small dogs. Watch how we create our embroidered nylon colors here. 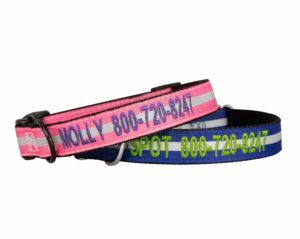 If you’re more of a tag person than an embroidery person, check out our nylon collars with a ScruffTag. The ScruffTag is built into the collar and sits on the scruff of your dog’s neck. No more jingling from hanging tags! We even have a collar where you pick pick the color of the ScruffTag. The tag is adjustable so that you can have the perfect fit. To see how to adjust the tag, check out this video. Our nylon collars are also available in martingale style. These collars are loose and comfortable, but snug up when your dog pulls on a leash. 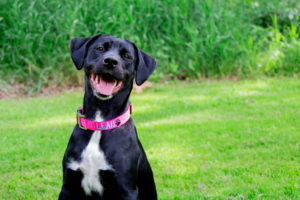 Martingale collars are great for training dogs that like to pull. 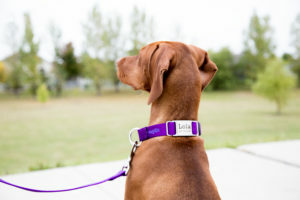 The collar evenly distributes pressure, which helps the dog learn to not pull on the leash. They can be embroidered or have an engraved personalized buckle. We also have a nylon + chain martingale. Looking for the perfect collar for any holiday season? Look no further! These adorable embroidered collars have a Halloween, Christmas, Valentine’s Day or St. Patrick’s Day design. Want a holiday collar with a tag? Check out the Holiday ScruffTag collar. Have your dog be a part of this special time in your life. Need a creative way to propose? Get an embroidered proposal collar for the perfect surprise. Then, let all your wedding guests know how to share their memorable photos with you with an embroidered wedding hashtag collar. Add a little personality to your dog’s collar. With our Signature Design Collar, you can have your dog’s name and phone number alongside a bone or paw print. The Nautical Collar includes either a sail boat or an anchor for the water loving dog. If your dog’s favorite place to be is outside, they would love the Sunshine Collar. This collar has an embroidered image of sunglasses or a setting sun. If you and your dog are travelers, the Adventure Collar is the perfect choice. Your dog’s name and phone number will be embroidered alongside a compass design. Want a collar with a fun pattern? We’ve got plenty to choose from. 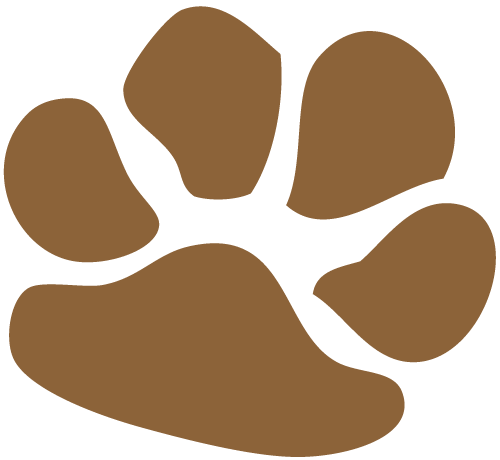 There’s a collar that has a chevron, diamond, paw print or arrow pattern. There’s also a nylon striped collar that can be embroidered with your information. 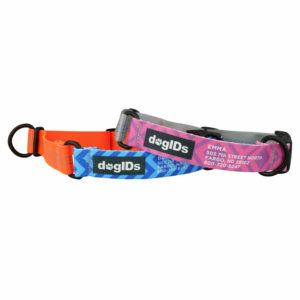 Choose a unique design with the embroidered maya collar or even have a digital camo pattern! 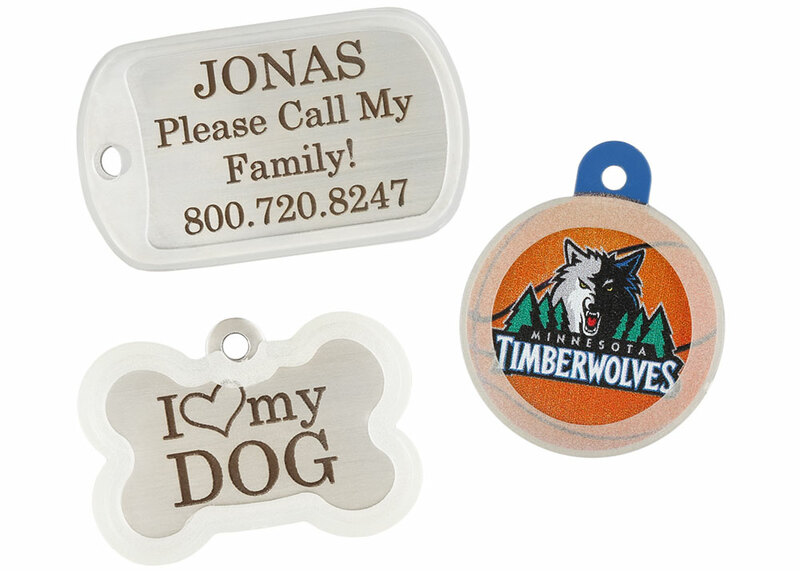 If you’d rather not have a tag or embroidery on your dog’s collar, we’ve got an option just for you! 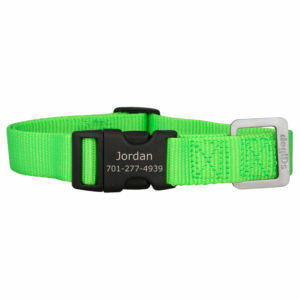 The personalized buckle collars have your dog’s information engraved right on the buckle of their collar. Choose a classic nylon collar, a patterned designer collar, a striped ribbon collar, or even a martingale collar with a personalized buckle. If there is something about your dog that others need to be aware of, have it displayed right on their collar. 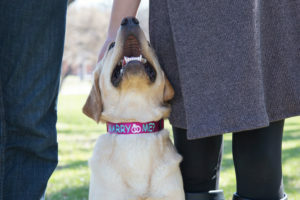 Our Service Dog Collar is embroidered to make sure that those around you know your dog is a service dog. 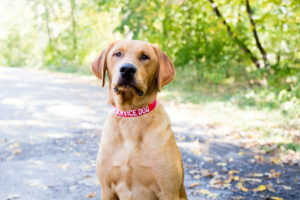 The Medical Alert Collar can be personalized to your dog’s specific medical condition. A QR Code Collar is a great way to ensure your pet is returned home safely! If your dog wanders off and someone finds them, they can use a smartphone to scan the code on your dog’s collar. 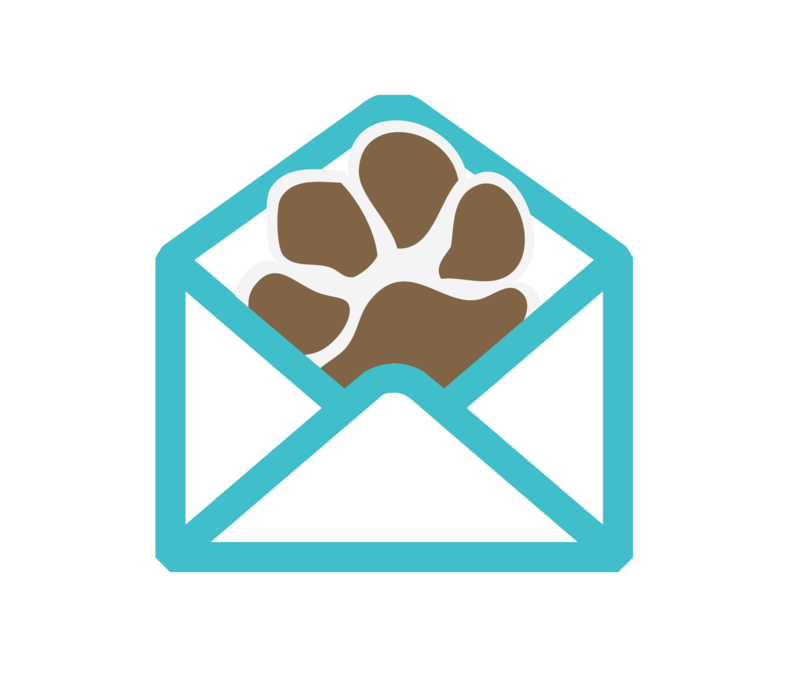 The code is linked to a profile with all of your dog’s information. You can even have your phone number on the tag for those that don’t have phones that can scan. 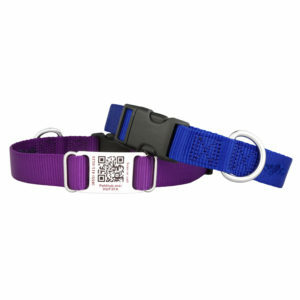 Choose a classic silver ScruffTag or choose a color with a colored ScruffTag QR Code Collar. Need a collar that is comfortable and safe to wear at night? The nylon reflective collars are great for dogs that go on evening walks. 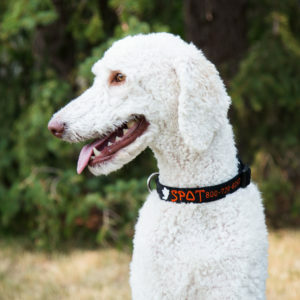 Have your reflective collar embroidered or choose a personalized ScruffTag. The great thing about nylon is it is easy to clean. Check out this video to see how. Nylon is an incredibly durable fiber but can have a tendency to fray. Luckily, this is super easy to fix. Check out this video to see the simple solution. Of course you want your new nylon collar to fit your dog perfectly. To see how to easily adjust these collars, watch this video. Sabrina is a content and marketing intern here at dogIDs. She is currently studying retail merchandising at NDSU. She enjoys reading and watching Netflix, but her favorite activity is exploring the outdoors with her pup, Peanut. Next articleWhy Is My Dog Eating Grass?